The measured parameters of the air-void structure are total air content, spacing factor, and specific surface. A core is taken from the structure, sliced, ground, and lapped in the laboratory. The resulting surface is plane, smooth, and with sharp edges along the perimeter of air voids. 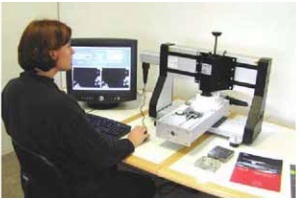 Before final specimen preparation, the lapping quality is checked under a stereomicroscope. The lapped surface is colored black with a hard stamp pad containing black ink. After heating the specimen to 55 ºC, a white zinc paste is applied to the surface with a rubber spatula. The zinc paste melts on the surface and flows into the voids. After cooling to room temperature, excess paste is removed from the surface with a straight, sharp steel blade. 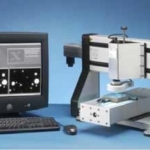 The quality of the black-white contrast is checked under a stereomicroscope. 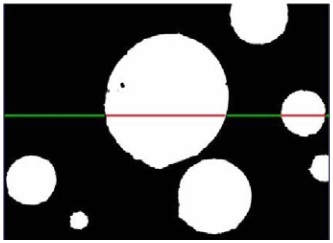 The voids should be filled totally with white paste and no white regions should be visible on the surface. Finally, voids in aggregates and obvious cracks are colored black under the stereomicroscope using a black marking pen. The photo on the left shows a properly prepared specimen. 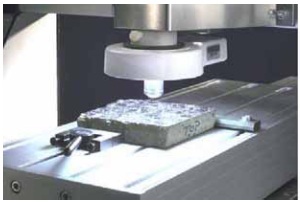 The preparation of a well-lapped specimen surface for analysis takes about 30 minutes. 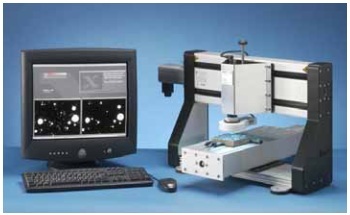 The RapidAir measurement is done within 12 min for linear traverse analysis and within 30 min for modified point count. 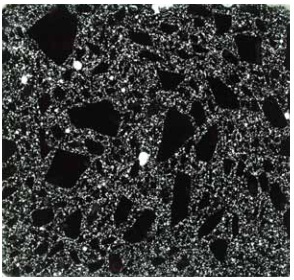 This should be compared with a time of 4 to 6 hours normally required for manual analysis using a light microscope in accordance with ASTM C457 or EN 480-11. Following contrast enhancement, the prepared specimen is mounted on a moving X-Y-Z stage positioned below a video camera. The RapidAir control unit automatically moves the stage, and the software determines the portion of the total traverse length that passes through the white air voids, as shown in the magnified view to the right. After the scan is completed, the air-void parameters are determined in accordance with ASTM C457 or EN 480-11. The specimen scan is saved automatically in a report file documenting the air content, spacing factor, and specific surface. In addition, graphical presentation of the air-void distribution and the raw data are available. Prepared specimen positioned on the moveable stage ready for image analysis. Overall view of RapidAir system in operation. 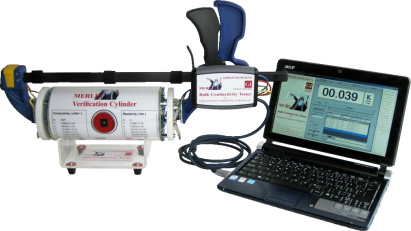 The RapidAir-3000 system shown to the right comes as a complete system, ready to plug in and operate, including PC with software, control unit, and manual. A one day course is offered separately by a RapidAir specialist.